Cassie Collinson recalls the day nearly three years ago when she started her portable restroom business, Cassie’s Cans in South Kingstown, Rhode Island. “The first six months were just getting the ball rolling,” says Collinson, who launched her business with 20 portable restrooms and a flatbed truck when she was only 20 years old. 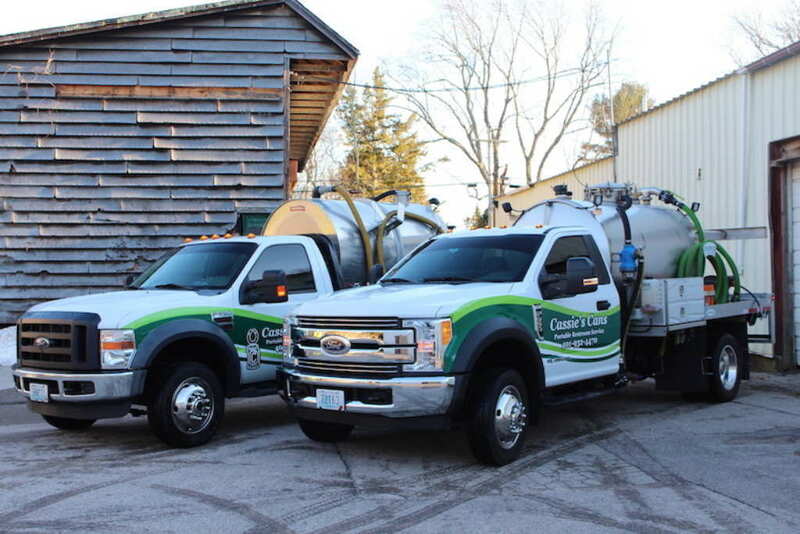 Today, she has 190 PolyJohn Enterprises restrooms, two trucks (a 2008 Ford F-550 flatbed with 500-gallon waste and 200-gallon fresh aluminum tank by Progress Tank and a 2017 Ford F-550 with 700-gallon waste and 300-gallon fresh stainless steel tank from FlowMark Vacuum Trucks and PTO-driven National Vacuum Equipment 304 pump), as well as two trailers to haul units. And she’s brought on another employee — 21-year-old Karissa Jacobson. Together, the two young women are making others in the business — and their customers — take notice of their professionalism and customer service. In a somewhat roundabout way, Collinson got her start in the sanitation business when she began working with her father, Richard, at his company Guaranteed Rooter Service in West Kingstown, located about 50 minutes from Providence and only 15 minutes to the Atlantic coast. After graduating from high school, she tinkered around with part-time jobs, including landscaping, and then, “I had the crazy idea to open a portable toilet company. And while she worked with her dad for a few years — now they’re in the same office space and she still does her father’s bookkeeping — Collinson is running Cassie’s Cans on her own, driving (and fixing) her own trucks (often with her dog, Ozzie, in tow), servicing the units, and finding new customers. She financed her venture with a business loan and started out with a few small contacts she had through her father’s business, which she says she will likely take over someday. It wasn’t always smooth. “I had to learn how to empty my truck at the treatment plant,” she says, recalling the day she backed up to the wrong spot. “We learned it, went out, pumped a few toilets … learned what to say.” She and Jacobson still do get few surprised looks when two young women show up on a job site. In addition to learning the vacuum pumps, hoses, and technical part of her job, Collinson also had to learn what program to use for billing, how to file quarterly taxes for an S corp, how to apply for licenses, and where to get rid of the waste. She got her strong work ethic from her dad. She admits that she is sometimes “so stubborn that I want to do everything. I’ve always been so driven by the business because it’s doing well. That’s the benefit of it, the driving force. She supplies restrooms to construction sites, weddings, parties, and community events throughout the state, but the majority — she estimates about 80 to 90 percent — of her units go to construction sites. This past year was Collinson’s busiest summer yet, servicing more than 180 job sites with her distinctive, two-tone bright-lime and dark-green restrooms. The driving force behind Collinson these days is continued expansion: She has hired Jacobson, bought more units, reinvested in her business and even bought her own house this year. Collinson doesn’t know what the future will hold for Cassie’s Cans, but she says, “I want to make both my parents proud; I want to be able to come into the industry and say, ‘Yes, we did that.’"